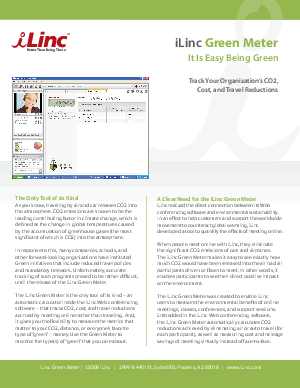 iLinc’s patented Green Meter technology works continuously in the background of all of iLinc web collaboration sessions (online meetings, webinars, and training/learning). It ingeniously calculates the location of each meeting attendee and then tracks carbon emission avoidance and related metrics as a result of meeting online. Fully visible during meeting sessions, it shows attendees their real-time savings in travel costs and CO2 emissions, providing a quantified reminder of how they are helping the environment by choosing to meet online rather than driving or flying. Beyond the feel-good benefits for iLinc meeting attendees, the Green Meter also quantifies travel savings for organizations needing to demonstrate ROI. iLinc aligns with many institutions’ green and sustainable policies, and is often a deciding purchasing factor for government and education organizations, as well as private sector companies. iLinc’s customers are on track to save two billion pounds of carbon emissions from harming the environment since Green Meter was launched. Download our whitepaper for more information.